Well this will be the last Abridged page till the newest issue is completed. This issue was the big finale of my alien story line and the Prologue. I LOVED making this issue ^_^ All the build up and everything came down to this point! Since it was my 1st story I wanted people to be sure that I do NOT mind killing off characters! Knowing the Prologue was a 1 shot story before the real story began I could use that to my advantage as most people figured no one from DLP would survive to see the new story. One of my favorite things to see is a great big overcoming the impossible odds moment. Surviving the no hope situation. Of course I had to pull out the Dues Ex Machina to do it for this particular story XD But that's acceptable sometimes too! And I think it worked extremely well to reveal a key aspect of Sally. 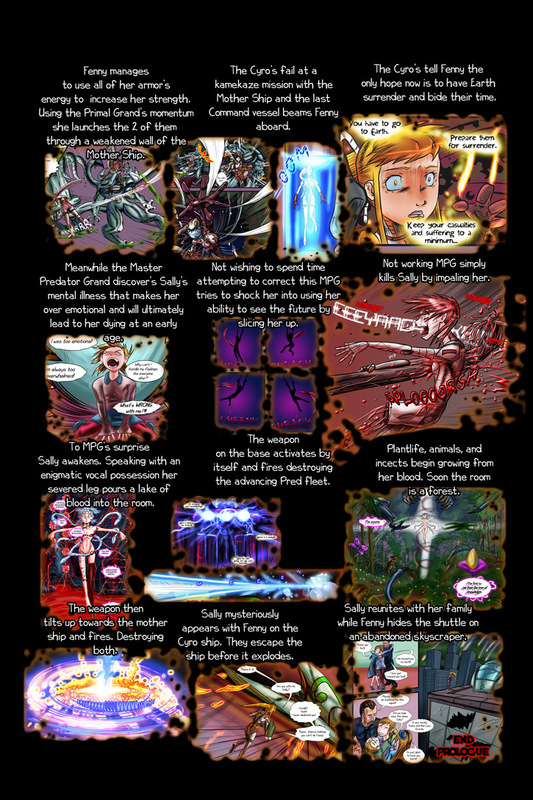 The big reveal of the Prologue was that Sally's chosen ability is simply that she is Eve. Yeah, that Eve from Adam and Eve. And pretty overpowered and God Like while Eve is in control. By the end of this issue the Cyros tell Fenny and Sally that they need to locate the other 5 chosen on Earth. So they can come together and stop something called Fathums.